Late last year, Amazon launched Echo, its voice-controlled speaker with attitude. Although it looks like little more than a futuristic cylinder, Echo can answer questions or perform tasks by being spoken to. Now Amazon wants you to play games on it. 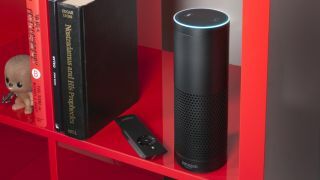 Speaking at GDC 2015, Amazon Developer Evangelist David Isbitski invited developers to start building games for Echo. Amazon has just launched a beta SDK for developers to start making custom apps, along with a sign-up page that you can find here. "This thing would be great as a dungeon master," said Isbitski. "It could say, 'go left or right', and you could say 'go right'. You could tell this thing to tell me jokes. There's so much potential here."